Michigan Atlantic Salmon on the St. Mary’s River in Northern Michigan. During late July and early August, we offer guided fly fishing for Atlantic Salmon on the St. Mary’s River in Michigan’s upper peninsula. These salmon are the most amazing fighters of all time! Incredible flying jumps, burning runs down to the backing, and violent head shakes! These fish are on fire and aggressively take to the fly!! During mid to late summer, Atlantic salmon migrate from Lake Huron into the upper stretches of the St. Mary’s River near the Soo locks. Atlantics feed on caddis, rainbow smelt and Hexagenia nymphs in the St. Mary’s during the summers months, preparing for their spawn in late October. These fish offer some of the best angling opportunities on the fly! When the salmon enter the rapids in July, they are mint silver, chrome and red hot! Atlantics are excellent fighters and also offer wonderful table fare. 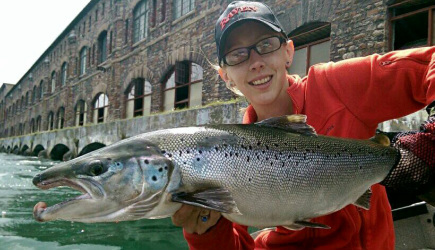 When fishing is good, limits of salmon are normal, especially in July. Anglers are allow to harvest three Atlantic salmon per day. We offer three types of ways to fish these. Fly fishing is one of our favorites! Centerpin angling is another great way to fish these. Long drifts make for great hook sets and incredible leaps! Spinning and baitcast gear also works very well for Atlantic Salmon. Salmon eat a variety of baits, with flies being number one on their diet. They also bite crankbaits, small spoons, and minnow – smelt imitations. 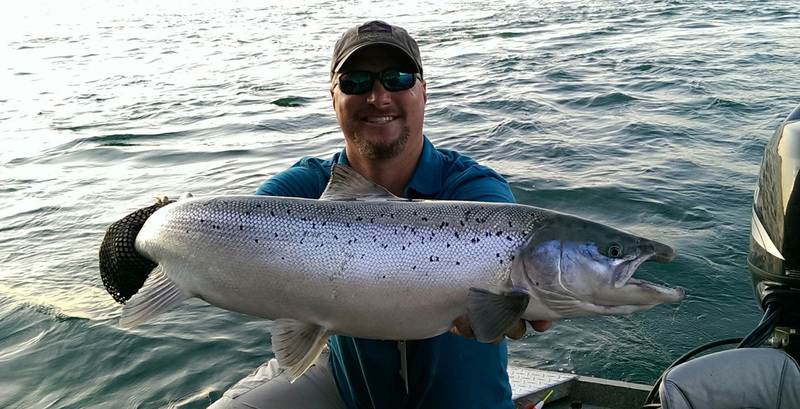 Gorgeous Michigan Atlantic Salmon in August.